At Christmas I do my best to avoid seeing Charles Dickens' A Christmas Carol. Bah, humbug! I've seen so many theatre and film productions of it and even played parts in it as an actor, and as timeless and wonderful as it is, people forget that there are other rarely done Christmas plays and musicals just begging to be mounted. I made an exception this year, went to Mrs. Scrooge The Musical in Santa Monica, and am so glad I did. There is something about Diane Namm's script and the imaginative execution of it that creates a thoroughly captivating experience - its tunes, the actors, twists in the story... and the overall contemporary upbeat ambiance. It's a joyful, tuneful ride. I don't want to give too much away, but Scrooge (D. Kevin Kelly) takes a backseat to his wife Mrs. Scrooge (Kelly Derouin), a corporate executive who believes herself "perfectly entitled", thereby mistreating her assistant Miss Cratchit (Heather Cadarette) and putting a damper on everything Christmas. A Christmas Carol in reverse, it is she, therefore, who does the hating, as he attempts to lead a somewhat normal life. Namm has ingeniously interwoven into the plot, borrowing from It's a Wonderful Life, a Teen Angel (David Burrus) who longs to earn his wings, and must do so by converting Mrs. Scrooge. There are also evil ghosts headed by the Ghost of Christmas Future (Jake Hamilton Lewis, also playing Mrs. Scrooge's father) who plot all things ominous in the story. There's some snappy choreography (Evie Hutton), many delightful tunes composed by Namm and Ed Cha, and even great audience interaction with the characters. Chris Stone has designed an ultra modern set which serves interior/exterior venues efficiently, including two rear projection screens for various colorful holiday pictures, and Rosalie Alvarez has designed some lovely costumes. Namm's direction is fast paced and bright throughout, never letting us forget that though this is a fable, it's one to be ultimately savored. The cast is sublime. Derouin is appropriately stern and obnoxious as Mrs. Scrooge. She also has a winningly beautiful singing voice. Cadarette as the loyal servant Cratchit is an equally adept actress and singer. Jake Hamilton Lewis is delightfully dextrous as the Lead Ghost and David Burrus' in.your.face attitude as Teen Angel is a winner. Amber Morse is terribly fetching as Head Angel and deserves a number all by herself, as does Kelly as the downtrodden Mr. Scrooge/Charles Dickens. Bravo as well to Asher Bank as Tiny Tim, and to ensemble members: Lee Pitts, Katy Tabb, Claiborne Thomas Jr., Jesse Turtz, Sarah Ann Vail and Frank Weidner. This is a super talented ensemble! Go see Mrs. Scrooge The Musical presented by West of Broadway! It's a 60-minute original crowd pleaser like no other. You will have a ball! Kelly Derouin (in blue sweater) who plays Mrs. Scrooge shows her revitalized Christmas spirit. The Christmas season has arrived in Santa Monica with “Mrs. Scrooge,” a musical stage adaptation of Charles Dickens’ “A Christmas Carol,” which is being presented by the West of Broadway Theater Company through Dec. 24. 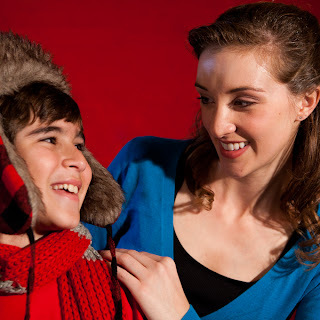 The musical is written and directed by Santa Monica-based children’s book author and filmmaker Diane Namm who tweaked the timeless tale into a 21st century comical masterpiece. 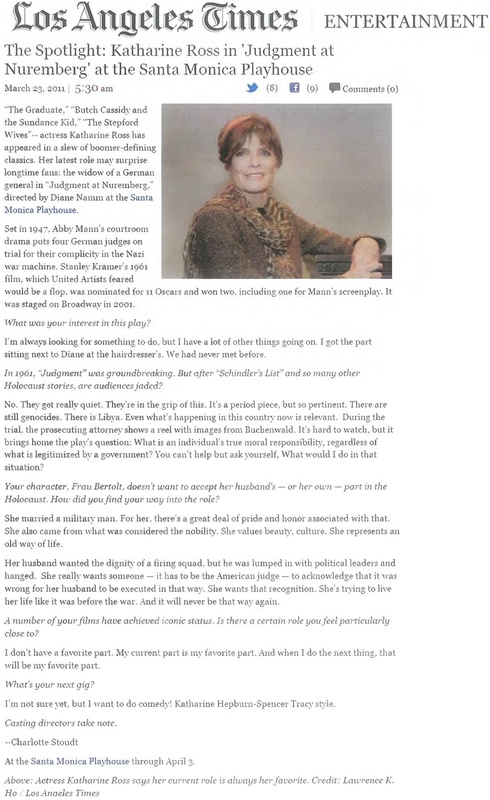 In doing so, she has accomplished a highly original musical similar in the methodology undertaken by Tom Stoppard’s “Rosencranz and Guildenstern Are Dead,” who rewrote Shakespeare’s “Hamlet” in the 1960s. Namm’s adaptation of “A Christmas Carol” injects a children’s twist by inventing Mrs. Scrooge as the lead character, a grumpy lady who hates Christmas. The musical is filled with singing, dancing, and compelling Christmas cheer that will soften even the grumpiest of spirits. The musical is simple and smashes any outdated expectations by introducing another new character – Teen Angel. Teen Angel, played by the loveable David Burrus, allows the musical to relate to current events affecting society. 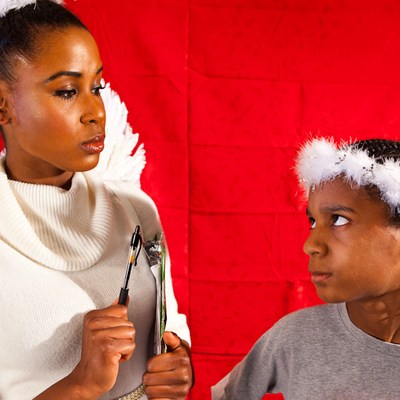 One example is “I Want My Wings,” an “Occupy Heaven” protest song performed by Burrus as he attempts to secure his angel wings from Head Angel, instead of completing his mission to convince a selfish and grumpy Mrs. Scrooge to like the spirit of gift giving. Mrs. Scrooge, played by Kelly Derouin, does her best to rebuke the angel and the ghosts, but is eventually convinced to be charitable on Christmas. Namm has been writing screenplays since 1998 and stage plays since 2005. She also writes adaptations of classic novels for young readers for Sterling Books, a division of Barnes and Noble Booksellers. The tale of “Mrs. Scrooge” whisks the audience through the peak events of “A Christmas Carol,” adds Teen Angel’s introduction in heaven, and follows Mrs. Scrooge’s Christmas shopping bonanza (she buys all the gifts for herself). The musical follows her back to her house where she fires her upbeat and gift-giving employee Miss Cratchit, played by the carefree Heather Cadarette. 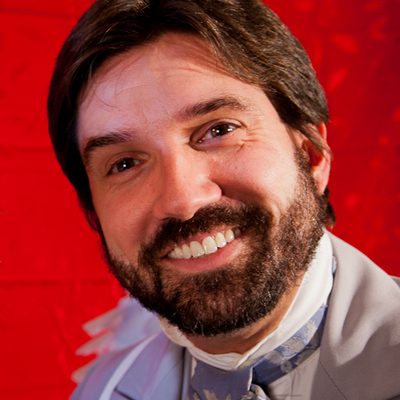 Mr. Scrooge (D. Kevin Kelly) plays a perfectly slavish husband who follows Mrs. Scrooge’s every command without question, which adds to the comic relief of the musical. Modern day adaptations of the three ghosts set to visit Mrs. Scrooge set the stage for some eerie rib-tickling delights. 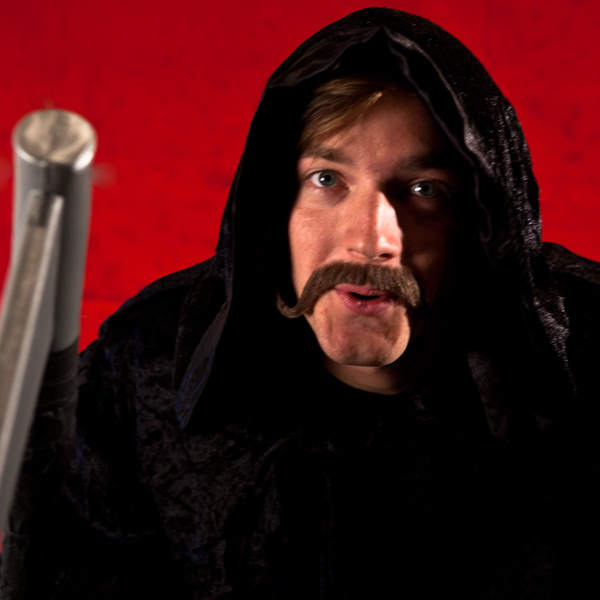 The Ghost of Christmas Present adds more laughter and song and is played by bushy blonde-haired and fun loving Frank Weidner. The Ghost of Christmas’ Future – that in this play speaks and interacts with the main characters – is only interested in character’s expiration dates and is played by the talented Jake Hamilton Lewis. At the end of the play, audience members are given the chance to interact with cast members by tossing rubber snowballs at the goading Ghost of Christmas Future. The music in “Mrs. Scrooge” is original. Composed and arranged by Robert Agis and Michael “Mac” Cooney with lyrics written by Diane Namm with Ed Cha; with two additional songs by Terence Davis. “Mrs. Scrooge” is performing additional shows through Dec. 11 as a guest production at the Other Space, Santa Monica Playhouse on 1211 Fourth Street in Santa Monica and at the Highways Performance Space at 1651 18th Street from Dec. 16-18 and Dec. 22-24. Show times vary from afternoon performances at 3 p.m. to evening performances at 7:30 p.m.
For tickets and further information, visit http://www.westofbroadway.org or call 424.234.9962. Every Christmas, you watch the same old movies — A Christmas Story, Miracle on 34th Street, and A Christmas Carol. Don't you think it's about time for some modernized Christmas performances? Instead of Ralphie begging his parents for a BB gun, let's change the scenario by making him ask his parents for a Barbie Doll. And what about Miracle on 34th Street? Instead of Kris Kringle actually being Santa Claus, why not just make him into a loveable schizophrenic? And, I don't know, how about we change Scrooge from A Christmas Carol into a woman and reverse old British gender roles? Well, you're in luck, because this Sunday, West of Broadway performs Mrs. Scrooge the Musical, a hip adaptation where Scrooge's wife is a powerful CEO. This amazing new musical written by Diane Namm takes aim at the holiday season and Dickens' portrayal of women. Mrs. Scrooge is meaner than Mr. Scrooge and treats her assistant like dirt. Mrs. Scrooge doesn't even believe in ghosts, until the ghost of Christmas Future tries to teach her the true meaning of Christmas. And relax, there's still Tiny Tim. Don't miss this family and feminist friendly adaption of Dickens' classic. Highways Performance Center, 1651 18th St., Santa Monica; Fri.-Sun., 7:30 p.m.; Sat.-Sun., 3 p.m.; closes Sat., Dec. 24 $20. (424) 234-9962 or westofbroadway.org. Tucked away on the side streets of Santa Monica, The Highways performance space, (1651 18th St, Santa Monica) is presenting a holiday treat. It's Mrs. Scrooge: The Musical, a modernized adapted version of Dickens' A Christmas Carol ready for family audiences and geared to entertain children and adults alike. I think my favorite song of the evening was the finale, "Angels Are Watching Over Me." The dancing, choreographed by Evie Hutton, was perfect as were those in the ensemble - Sarah Ann Vail, Jesse Turtz, Claiborne Thomas Jr., Katy Tabb, and Lee Pitts. Costumes, done by Rosalie Alverez, were wonderful . She was assisted by production assistant, Jenafer Grant and associate producer, Renee Schrader. The minimalistic set, done by Chris Stone, worked wonders for the play. Lights were done by R. Christopher Stokes and sound by Michael Shear, and the stage was managed by Ashly Jo Navarro. Not only did Diane Namm write it, but she directed it, too, and with the help of Ed Cha wrote all the songs. 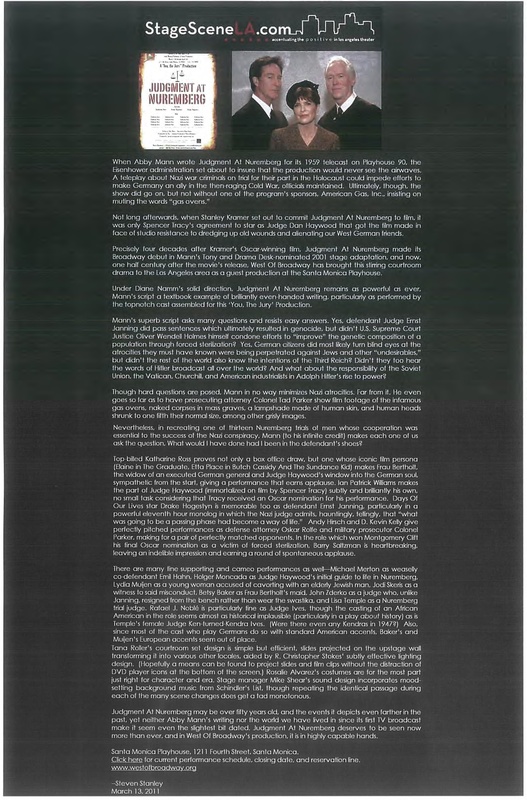 Original music and arrangements were done by Robert Agis and Michael "Mac" Crowley. Former Disney publishing veep and author of 65 books, Diane Namm (www.DianeNamm.com) has turned her many talents into a charming modernized adaptation of A Christmas Carol. "West of Broadway was the perfect company for my script because their motto is literacy through state." She hopes that seeing this interactive play will encourage children to read the book in its original form. Other things by Ms. Namm including film and teleplays as The Sacrifice, The Great American Pigeon Race, Finding Hope, Telemafia, SASA, and We'll Always Have Dingle. The only unfortunate part is that the play must move around and can only perform and weekends. Be that as it may, they have a 3:00 pm as well as a 7:30 pm performance daily. From Dec 2-4, 16-18, and 22-24 they are at Highways. 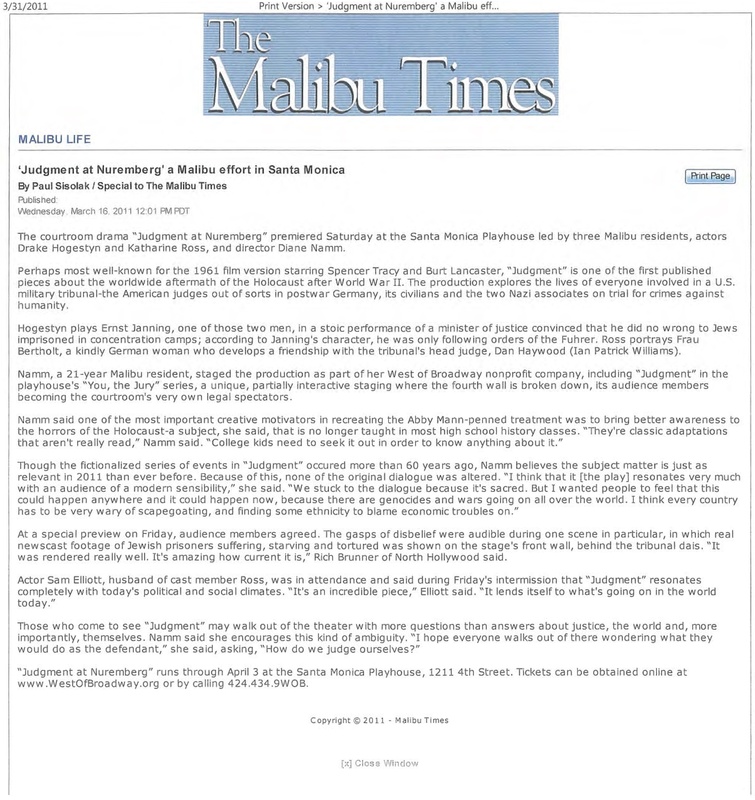 While December 8-11, the play can be seen at the guest production stage of the Santa Monica Playhouse (1211 4th St., Santa Monica.) Box office for Highways is 424-234-9962. 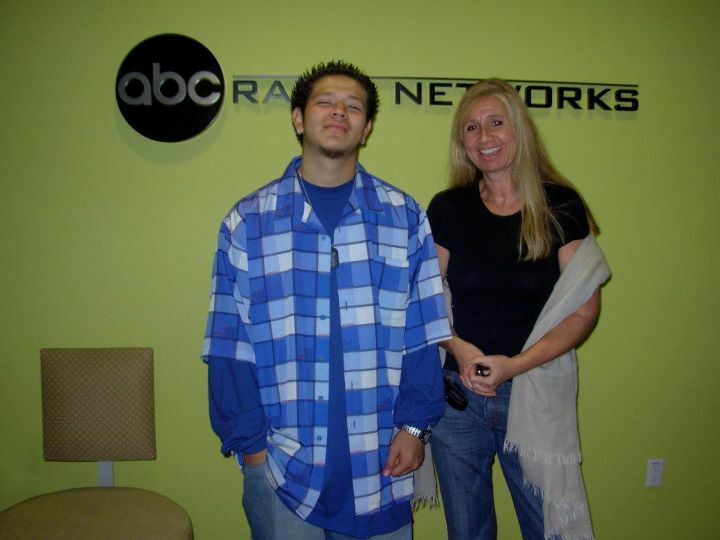 Writer/Director Diane Namm is interviewed on ABC Radio with her mentee Jose Ramirez, who dropped out of a gang and attended college in Portland thanks to her support. Santa Monica Mirror Loves Mrs. Scrooge! Children will love the hour-long Christmas show currently on stage at the Santa Monica Playhouse’s second stage. Based on the Charles Dickens classic “A Christmas Carol,” Diane Namm’s “Mrs. Scrooge” is community theatre at its best, a show full of broad comedy and silly bits of slapstick that will have the little ones rolling in the aisles. An interactive, audience participatory snowball fight is just one slice of this seasonal show’s frivolous fun. Mrs. Scrooge (Heather Stewart) is a spoiled, Los Angeles housewife. She alienates her husband (D. Kevin Kelly), her assistant, Ms. Cratchet (Samantha Whittaker), and pretty much everyone else with whom she comes in contact. Too busy filing her nails, shopping, and complaining about life’s little inconveniences to care about building meaningful relationships, this grumpy girl finds herself alone and snoozing on the couch on Christmas Eve. But there’s an angel (David Burrus Jr.) looking down on Mrs. Scrooge, and he’s about to visit her, bringing along three guests familiar to anyone even remotely acquainted with the Dickens tale. But these ghosts of Christmases Past, Present, and Future aren’t exactly like the ones in the original material. For comic effect, the ghost of Jacob Marley dresses more like the ghost of Bob Marley, and the ghost of Christmas Present (Anthony Kalatzis) is a goofy teenager who wants to dance and play. More serious moments occur when Mrs. Scrooge is visited by her deceased father (Elias McCabe) and when she gets a glimpse into the unfortunate circumstances of Ms. Cratchet’s life. Though the basic story is familiar, it borrows a bit from another Christmas favorite, “It’s a Wonderful Life.” The goal of the angel in Mrs. Scrooge is to get his wings, much like the goal of the beloved Clarence in the Frank Capra Christmas chestnut. And he has to report to a tough-as-nails head angel (Jaimyon Parker), who won’t let him earn flying rights until he turns a rotten person into a caring one. The blending of stories works here, mostly because it’s all about making kids laugh while teaching them a lesson or two about kindness, perseverance, and the rewards of good behavior. In fact, Namm’s theatre company, West of Broadway, was founded with the mission of promoting literacy and social responsibility through interactive theatre for children of all ages. With this show, that mission is definitely accomplished. On top of the doling out of important lessons for children, the show is also entertaining. Stewart seems to revel in her character’s complete inability to care about anyone but herself. Her comic timing and kid-friendly approach to the material are a service to the show. She isn’t afraid to ask the audience questions and make spontaneous replies to unexpected audience quips. My favorite part of “Mrs. Scrooge” was watching the sea of happy faces on the dozen or so children in the audience the night I attended. It’s a nice holiday gift to see young people having fun at the theatre. Downtown Santa Monica’s Third Street Promenade is known for it’s wonderful restaurants and cute little shops. But for a small city Santa Monica has big aspirations, and each December the entire community comes together to showcase its local artists and musicians in a daylong holiday celebration. Some of the festivities scheduled at this year’s Winterlit Celebration include children’s ornament decorating, cooking demos by various local chefs, a meet and greet with children’s author Diane Namm, as well as a World Record attempt at the largest dreidel spin contest. The festivities conclude with the lighting of an oversized Christmas tree (What’s a holiday celebration without one? ), followed by musical performances by Jessara, Jared Lee, and Tyler Hilton. With so many holiday festivities to choose from, all that’s missing is real snow! Examining what it means to truly perform citizenship and honestly dole out justice, 12 Angry Jurors, Sherman L. Sergel’s modern adaptation of Reginald Rose’s classic play, contains intense, hearty performances in its thoughtful production. Produced by West of Broadway as both a literacy and civic responsibility tool, the play operates interactively, asking the audience to vote on the defendant’s guilt or innocence and, therefore, possibly predict the outcome. Charles Dickens’ 1843 novella A Christmas Carol – the story of Ebenezer Scrooge’s yuletide conversion from curmudgeon to altruist – is subject to perpetual reinvention. Traditional mountings of the tale pop up everywhere. Theatre artists naturally seek innovation twists on the material, and this season Back Stage noted a few especially unusual versions playing around the country.